To protect the present, Guardians Incorporated needs to know the future. Ah, the rejection blues! When all the hope built up during those long, interminable weeks that pass between sending a query letter or a manuscript and receiving a response is annihilated by the simple "Thank you, but...."
I blame the "but.." God, how I learned to hate the "but...". Its unavoidable... rejection always feels like a stab in the heart, or at least the spleen, depending on who rejects the manuscript and your hopes about that literary agent or publishing house taking up on your manuscript. "Let me enjoy my depression in peace." He said. "I'll be over it tomorrow." He was so blue he looked like a Smurf. So yeah, embrace it, turn it around, go back and edit, fix, twitch and fiddle with your manuscript, then do it again. Or, if you get tired of the "but.." like I did, self publish, BUT (and this one applies) please, do it only after editing, fixing, twitching and fiddling...thoroughly and preferably with the help of a professional... at least the editing bit. Hopefully, and with a lot of work,(and let's be honest, wishful thinking) you might hit it and then maybe the "Thank you," people will come looking for you and you will be the one saying "Oh wow!...This is great!..but..." So turn blue, embrace it, might as well try to enjoy it and use it in your writing, learn from it and then dream a little dream... and get over it. BTW... my Smurfy friend found his Smurfette a couple of years later... and now they have little Smurflings of their own. He got over it and so can we. Buy your copy of The Cypher today! Julian Rosado-Machain has enjoyed pizza in three continents, worked in graphic design, armored vehicles, built computers, handcrafted alebrijes, and swears has seen at least one ghost. 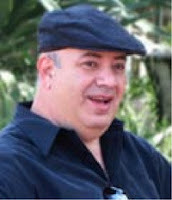 He's the co-owner of a Mexican restaurant in San Diego, California and enjoys the sun with his wife, three children, and cat. You can find out more about Julian and The Guardian series on his Website, Facebook, and Blog! 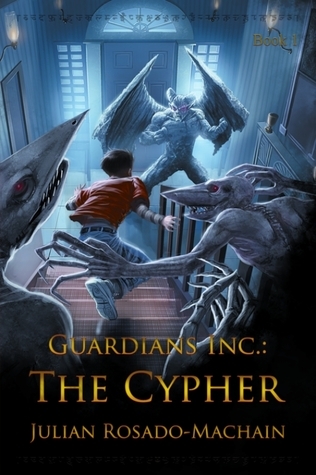 Win a signed copy of The Cypher by Julian Rosado-Machain! Just follow the instructions on the Rafflecopter form. Oh look, this one actually has a pretty good cover. I know! I was surprised. I was almost tempted to read it, if it wasn't for my embarrassing pile.